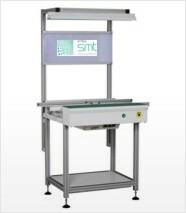 Our SMEMA compatible transfer conveyors can be used for a wide range of applications: equipment linking, visual inspection, manual assembly, and PCB buffering functions throughout the production line. 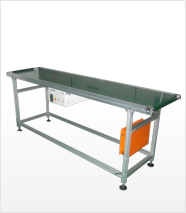 BC Series conveyors feature a stationary front rail and a movable rear rail (adjustable via hand crank) to accommodate boards from 50 mm wide to 460 mm wide. 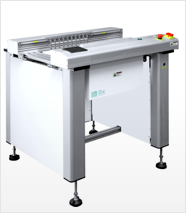 All of them use flat belts and come in lengths which range from 500 mm to 2000 mm. 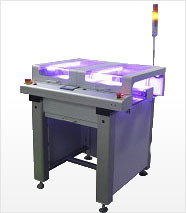 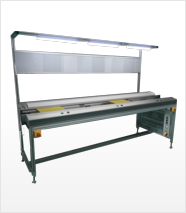 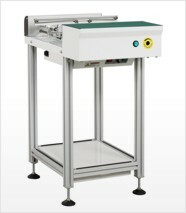 Conveyor speed is variable and dial adjustable from 0.5 - 20 m/min. 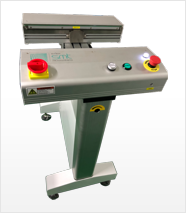 Each system comes with an auto/manual selector and a side button that allows operators to deactivate the conveyor so that boards can be removed and placed on the inspection/work table adjacent to the front rail. 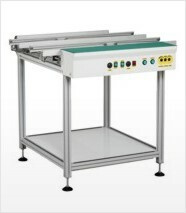 Made by aluminum and steel, it gives a professional look. 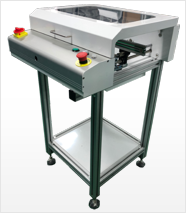 We also have under demand, better-looking versions made with aluminum finishings, for a higher aestetic impression.